Beginning in 1897, artist Edwin Deakin traveled to all the missions of California on a pilgrimage to capture them as they fell into decay. These watercolors from that journey have not been seen until now. 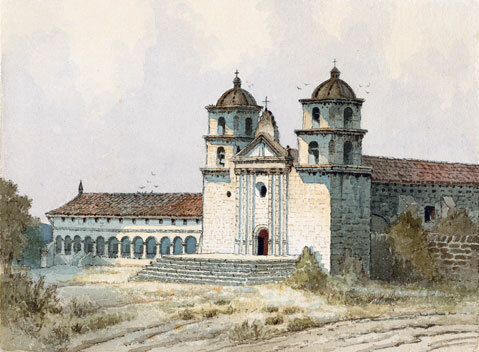 A solitary pilgrim, the formidably mustachioed Edwin Deakin made these splendid pictures of the California missions in the two years from 1897 to 1899. Caught up in the enthusiasm for the colonial era generated by Helen Hunt Jackson’s 1884 novel Ramona, Deakin resolved to capture and preserve, with his eye and his brushes, what were at the time mostly ruins, decaying reminders of a lost way of life. Although in 2013 it can be hard to imagine Southern California ever looking any other way, these humble, elegant watercolors are an exquisite reminder that there was a time when the Mission Revival style was actually a new idea, and one based on a fascinating amalgam of sentimental antiquarianism, bold adventure, and dreamlike romance. What makes the Deakin show even more remarkable is the fact that these images were very nearly lost. Intended for publication as a book, they wound up sewn into a black bag for protection from the elements, which is where they remained through several shifts in provenance until Frank Goss fortuitously turned them up in a last-minute search to replace another set of Deakin missions that was originally scheduled to be exhibited. From an art historian’s point of view, these paintings are California gold. They have the pristine appeal of something done yesterday, yet they come straight out of the fin de siècle. Each individual canvas offers some evidence that, as Walter Pater once wrote, “every moment some form grows perfect.” In “Mission Nuestra Señora de la Soledad,” for example, Deakin finds the pitched shape of the mission’s roofless front wall engaged in a ghostly call and response with the mountains behind. These paintings — modest revenants — spring from that hunger, and they satisfy it. They go quietly amid the noise of 21st-century visual culture, calm in the knowledge that what was imparted to them so long ago can be lost but not be extinguished. Someday perhaps we will know once and for all what the missions mean. For now, through exhibitions like this one, we will continue to meditate on them.